Battery and charger must go together like horse and carriage. One does not deliver without the other. Chargers are commonly identified by their charging speed. Consumer products come with a low-cost personal charger that performs well when used as directed. The industrial charger is often made by a third party and includes special features. 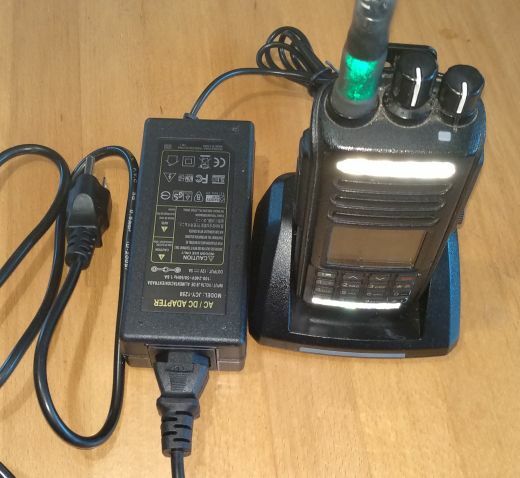 All the radios we sell come with an AC Adapter that plugs into the charger base with a 2.5mm plug. The nominal output of these is typically stated as 300mAh. There is a term in the battery community: "Chinese milliamps". This phrase has become a popular way to infer that the real milliamp capacity is measurably less. These power supplies, along with antennas, are a way for the manufacturer to lower the cost of the package. The Chinese AC Adapters that come with the radios will charge the radio battery overnight, and typically last a year or more before burning out. However professional users often require greater reliability and faster charging times. Accordingly, we set about to find a more robust aftermarket power supply for the charger base that will address the shortcomings of the OEM Power supply. This item is what we have come up with. The AC plug is 110-120V 3 pin North American. It is rated to provide 5 amps at 12V (16 times more power than the OEM power supply), and uses a standard 2.5mm DC plug with center positive polarity. As wel as suitable for charging the radio batteries, it can be used for other tasks such as charging notebook computers, etc. If you require greater reliability and faster charger times, then this is an affordable option that should be considered. This accessory can be ordered on the order form when ordering your radio. 1.5 AH power supply with TYT charger base.